This Swiss-cut platinum infinity wedding band is pictured here in a 7mm width, but is also available in widths from 5mm-8mm, allowing you to choose the perfect size for wear by both men and women. This stunning design from Apples of Gold Jewelry offers both polished and brushed platinum with a dazzling infinity symbol looping around the center of the ring. The infinity symbol is cut into the ring, creating a unique look that will remind you of deep and everlasting love. The wonderful comfort fit feature of this ring make it much more comfortable to wear. 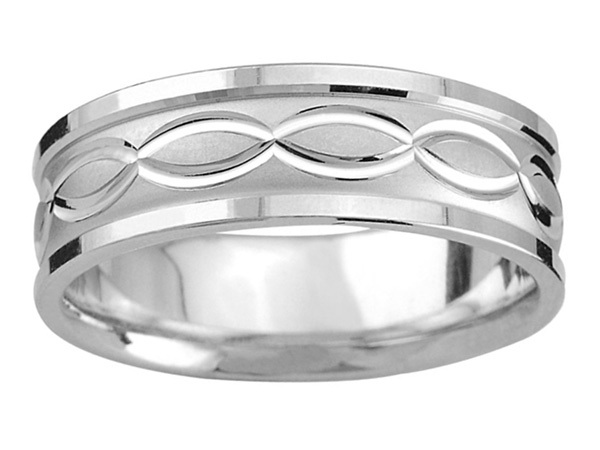 We guarantee our Swiss-Cut Platinum Infinity Wedding Band to be high quality, authentic jewelry, as described above.